Frank Zappa famously said, “You can’t be a real country unless you have a beer and an airline. It helps if you have some kind of a football team, or some nuclear weapons, but at the very least you need a beer.” Luxembourg, ergo, qualifies as a real country. Then again, Luxembourgers refer to it as a Grand Duchy, since it’s the only sovereign state ruled by a duke: Henri, Grand Duke of Luxembourg. Today, it boasts a whopping seven breweries. Per capita, however, it bests America, since the entire population is 550,000 and Americans have roughly 3,100 to slake 314 million thirsts. I schemed to hit them all. In a weekend. All visits should start in Luxembourg City to explore, on foot, its charming Old City with slate and sandstone façades everywhere you look. The Bock promontory, dating to 963, makes an ideal fortress since the cliffs served as three walls offering better natural protection than any walled city. It worked for several centuries. But the Burgundians, then the Spaniards, French, Germans, et al., had their way with this tiny land strategically centered in Europe. Think of it as the center square in a continental game of tic-tac-toe with its many occupants playing the role of dynastic x’s and o’s. 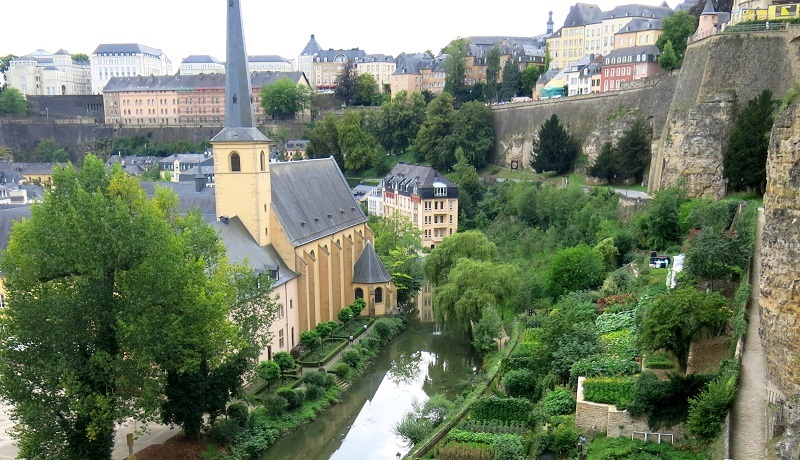 Unlike neighboring countries Germany, Belgium and France, Luxembourg hasn’t developed its own beer styles, but the breweries it does have are in beautiful locales. So, no, the name of the fortress rock may be the Bock—exploring the historic, man-made casemates is a must—but don’t expect to find Luxembourgish bockbiers lagering in them. Directly in the valley below on the banks of the Alzette River, the Clausen quarter is where the Big Beer Co. (12 Rives de Clausen), housed in the 500-year-old Brasserie Mousel, serves as a Bavarian-inspired brewpub geared equally toward families and young revelers. The entire old brewery grounds were redeveloped as party central with ample bars. Part of Mousel’s antiquated brew house remains in place, but the much smaller installation now brews Clausel (a portmanteau of Clausen and Moselle—the river for which Alzette is a eventual tributary). Clausel Pilsner is sold in both filtered and nonfiltered form. I preferred the nonfiltered version of this extra pale lager since the creaminess rounds out its slightly tart edges. The abundant menu offers native, rustic dishes such as bouneschlupp (green bean soup) and judd mat gaardebounen (smoked pork neck with broad beans) and the largest roasted pork knuckles I’ve laid eyes on. For a nightcap, the adjacent quarter is fairytale-esque Grund, where Liquid Bar (15-17 Rue Munster) offers what must be the city’s largest selection of bottled beer, including many from Belgium. Liquid, directly on the river, offers a small terrace with idyllic views. While in town, sweet-tooths ought to find Oberweis (1 rue Guillaume Kroll), a member of Fournisseur de la Cour, the guild of approved caterers to the royal family. If you can make it past the pastries and confections regally displayed on the ground floor, a gallery of chocolate-enrobed pralines awaits upstairs. Fans of both cocoa and peaty Scotch need to get the “Islay” infused with Laphroaig and framboise. Most Luxembourgish breweries are in the northern region of the Ardennes. Ourdaller in Heinerscheid (Hauptstrooss 83), the northernmost brauerei, produces less than 400 barrels a year at this Brasserie Simon-owned installment tucked into the pastoral Cornelyshaff Hotel. The brewery is open for visits on Fridays from July through September, but goes on holiday in August. Otherwise, group-only tours may be arranged in advance. The most distinct beers are under the Ourdaller brand—an Ourdaller is someone from the nearby Our Valley along the German border—and include Wäisen, a light and refreshing hefeweizen and Wëller, a Belgianish red ale with more than a hint of yeast spice and toasty malts. Eight kilometers to the south in Clervaux, the humanist collection of photographs, The Family of Man (SteichenCollections.lu), curated by Edward Steichen (a native Luxembourger) initially for a 1955 installment at New York’s Museum of Modern Art (MOMA), is on permanent display. The quotidian poignancy is powerful enough to demand a visit. Heading back south but still in the north, the aforementioned Brasserie Simon (14 rue Joseph Simon) is in Wiltz. Simon brews several styles, but as is expected, Simon Pils is the flagship. The hoppiest of Luxembourg’s blond lagers is a treat, but for something a touch different, Dinkel is brewed with spelt, and the extra graininess could almost give brown ale fans something to sate themselves with. The Belgian witbier brand, Okult No. 1, can be hunted down. The banana sweetness of this wheat beer actually extracts pear notes via ample orange peel. Brasserie Simon is near the lowest elevation in this hillside town, but well worth the uphill hike is the Musée National d’Art Brassicole (35 rue du Château). The National Brewery Museum, replete with Luxembourgish breweriana (there used to be more than seven breweries) and explanations of the brewing process, is fun for the whole family. Southward still in Heiderscheid (careful not to confuse it with Ourdaller’s home in Heinerscheid) is Den Heischter (4 Bei Clemensbongert). You’ll know you got off at the right bus stop if it smells like a cow pasture. Luxembourg is mostly rural. The brewery itself was closed when I visited, but fortunately it’s adjacent to All In, a “family fun center” that features six bowling lanes, foosball and air hockey and bottled Heischter (a witbier). Speaking of breweries I didn’t enter, Luxembourg’s second-largest brand is Diekirch, brewed in the city of Diekirch. It’s owned by A-B InBev and refuses visitors. It’s frequently found in a cocktail called panachè—beer and cola—which I won’t be ordering a second time. The last destination on a comprehensive brewery trip to Luxembourg is Bascharage. Here, the largest of the breweries is the 100 percent family-owned Bofferding (2 Blvd. Kennedy). The ultra-efficient brew house produces 169,000 hectoliters (more than 140,000 barrels) a year of the filtered Bofferding Pils. This medical-grade clean pilsner brewed with equal parts Hallertau Perle and Herkules hops enjoys 60 percent market share. Among their Battin family of brands, brewed off site, there’s Extra (a Leffelike Belgian blond), Blanche (a German-style weisse), and even Fruité for fans of sweetened framboises. A proper visitors’ center is under construction. Finally, Bascharage’s other, much tinier brewery is housed in the restaurant/hotel Beierhaascht (240 Ave. de Luxembourg) that actually is an offshoot of the three-generations-old butcher shop. As such, the grilled ham braised in house beer was one of the best meals I had and paired with the Dark beer—think bock more than porter—was both delicious and a change from the norm, although the clean, tasty Helles is understandably the bestseller. And even if you do most of your drinking at Bofferding, a room here is only a kilometer away. And yes, there’s room service for both meat and beer. I spent two years trying to build a brewpub in Strassen near Luxembourg City in the mid 1990’s. Red tape by the government we decided to moved to Arlon next door in Belgium. They had open arms for us to build there– but we ran out of money and the banks were not helpful. Belgian beers are varied and delicioue. Now, after reading this article about Luxembourg brewing we want to visit these breweries to enjoy their brews too. Thank you for the article. I am interested in purchasing some beer from Luxembourg, do you know a website that offers beer shipped to the US? It is a gift for my husband who’s ancestors are from Luxembourg.